It is exceedingly rare in this day and age that the U.S. Postal Service opens a new Post Office. I mean an entirely new, USPS-staffed, postal retail operation. The fact is it just doesn't happen. Sure, there are plenty of 'new' post offices around at new locations; but those are nearly always the result of: a) a consolidation of two retail facilities into one at a different location; b) the downsizing of a post office to a new location within the same ZIP code once its carriers have been moved to a different facility; or c) the reopening of a post office that had previously lost its lease. In other words, very rarely do you see a physical net gain of a postal retail facility when a 'new' post office opens. 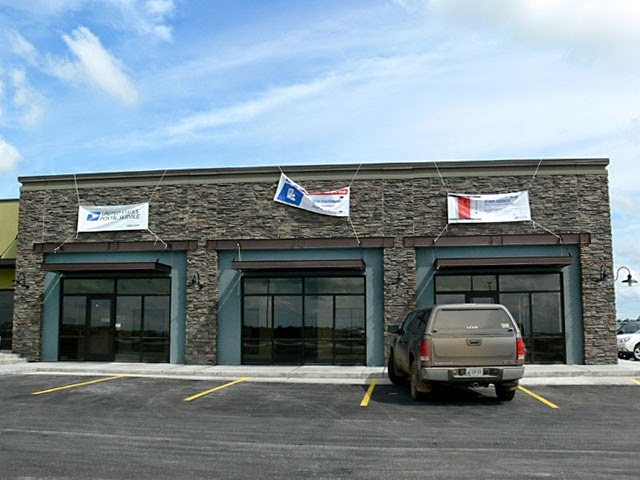 But a completely new postal retail unit is exactly what the oil boom town of Williston, North Dakota received as the Badlands Postal Store opened on July 1. Where is Williston, you ask? It's in a very remote corner in what was, before the advent of hydraulic fracturing, a very sleepy part of America. How remote, you ask? The town is more than 600 miles from the nearest million-person population centers. Minneapolis is 620 miles away, about the same distance as Williston is to Calgary up in Canada. Put in East Coast terms, that's the distance from Boston, past New York and D.C., all the way to a point 70 miles south of Richmond, Virginia. But these days Williston is at the center of the U.S.'s hottest job market. Of course, there's a map for that. The population of Williston has ballooned from 13,000 in 2009 to more than 20,000 today, and the growth shows no signs of abating. Much of the new development has occurred to either the north or west of the city's core, with particular expansion north along U.S. 2. The location of this new post office reflects this; it resides north of the town's airport, bringing the post office three miles closer to large commercial and industrial developments that have been built north of town over the past few years. Makes sense to me. As the city has grown so too have the demands on Williston's post office, with customers fretting over the ever-longer lines and wait times. North Dakota Senators Heidi Heitkamp and John Hoeven have been championing a new post office in Williston for some time; Minot's KMOT covered the opening and quotes Senator Heitkamp: "We have been struggling for many years. ... We've been trying to get upgrades to the Williston Post Office. As the post office is struggling financially across the country, I think sometimes it's very hard to convince them to make investments in a place where they don't have a lot of familiarity." Williston's Herald writes that postal service improvements have been made throughout the region, including the addition of 460 post office boxes in Parshall, 90 miles to the east. This said, the author observes that of the ten closest post offices to Williston, several have already been converted to Postmaster-less POStPlan operations: the towns of Trenton, Alexander, Arnegard, and Bainville [MT] now possess four-hour post offices, while Epping and Cartwright have been downgraded to two-hour operations. Should the populations in these smaller communities expand and should additional services be required, would these offices, too, receive reinstated hours and improved treatment? Back in Williston, the Badlands Postal Storelocated at 4315 9th Ave. W, Unit 411possesses 2,800 P.O. Boxes available for rent. Its inaugural retail operating hours are 9:00am to 4:30pm. The office itself is open 24/7 to enable maximum access to P.O. Boxes as well as a self-service kiosk in the lobby. Gary S., a friend of Going Postal, visited the Badlands Retail Store on its opening day and provided the following photos and much information for this report. The Badlands Retail Store is so named because it is resides in the new Badlands Town Center development, which, according to town documents, is to be a 5.5-acre retail center built near what will be a large new housing subdivision and Williston's Walmart. Groundbreaking occurred on June 24, 2013 and stores are slated to open throughout this year. (According to a developer, "100% occupancy" was hoped for "by the second quarter of 2014".) 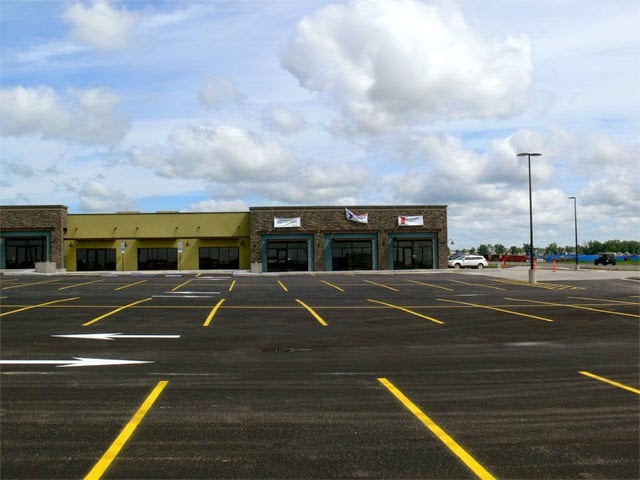 That said, the Badlands Postal Store became the first commercial operation to open in the development on July 1. The following are opening-day photos. Gary writes: "At first I thought I had the wrong place, as the parking lot was completely deserted, but then I saw the Postal Service banner on the building. I arrived about 2 1/2 hours after the post office opened and not a customer was around. The clerk told me that it had been a slow morning. Obviously, word about the new post office had not gotten out yet. I saw three clerks, they were mostly just getting things straightened away in the building." There was still clear work to do at the new facility. Only temporary banners were in place let customers know that a post office was open. (The author suspects that a permanent and backlit Sonic Eagle sign will be installed.) The door didn't yet have the stenciled lettering with the name of the post office and its hours of operation. Furthermore, the flagpole and an exterior blue collection box were not yet in place. Finally, there was not yet a postmarking device unique to the facility (only a hand-me-down from the Williston MPO). But with the Postal Service progress takes a little bit of time, and these issues will in all likelihood be resolved by the time the shopping center reaches full commercial steam and customers become more aware of the location. One of the great things about post office openings is that you're usually allowed to take photographs inside with minimal-to-no hassle, because USPS wants to show the facility off! 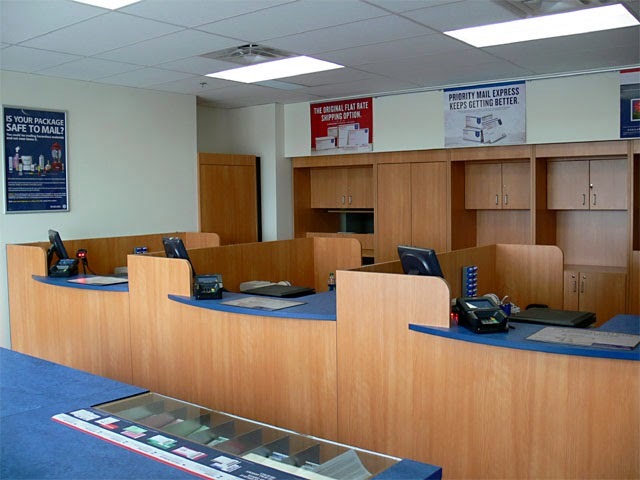 First-day interior photos at the Badlands Postal Store show a clean, modern facility. 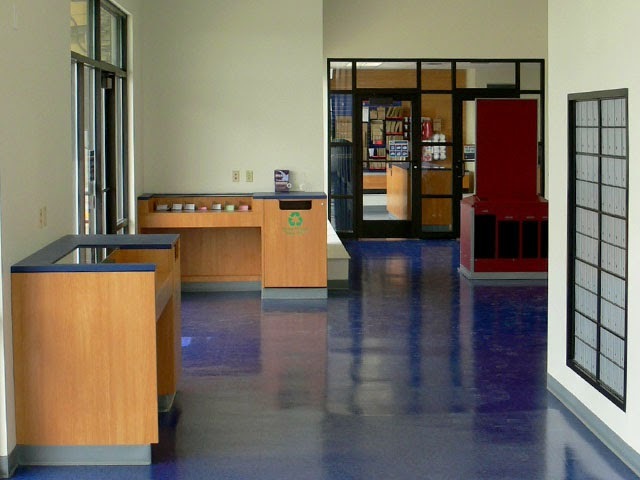 All the counters, customer work areas, and waste receptacles feature USPS's current faux-blue marble-atop-wood trim design motif. 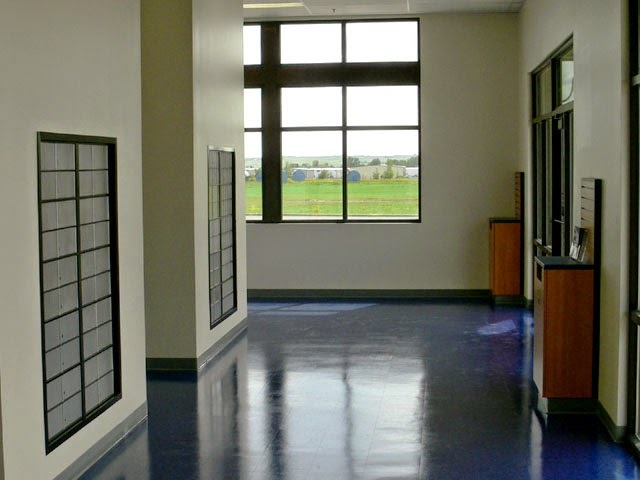 All work areas featured a complete collection of postal service [Insurance, Certified, etc.] forms. At the retail window three clerk stations were fully set up and ready to serve customers (though, based on the above first-hand observations it will take a while before post office traffic reaches full steam). Finally, here is a photo from the P.O. Box area. Relish the background view out the window: it's probably the last time you will see the landscape so comparatively pristine. Going Postal hopes to check back with the Badlands Postal Store in a few months, when the post office is more polished and we will likely find a much busier scene.